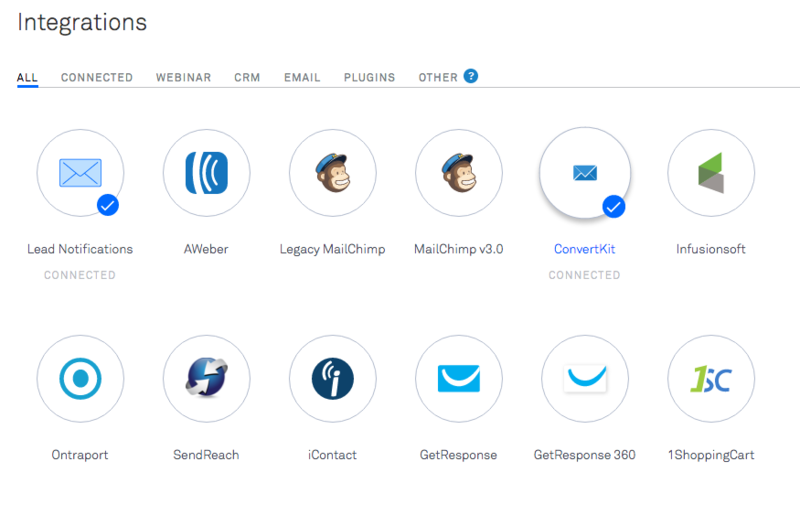 Connect your LeadPages to ConvertKit to collect Subscribers! UPDATE: Leadpages has added a ConvertKit API connection to their Standard Builder! You can connect your ConvertKit account to Leadpages on your Leadpages Admin > Integrations page! Create you Leadbox. On the Settings Menu, click "Add Integration." Select ConvertKit from the menu. Proceed with the above steps to connect your LeadPage to a Form! Our integration with the Standard Builder in LeadPages is now an API integration! Select 'ConvertKit' from the Integration Options. 3. Grab your API key from your Account page and paste it into ConvertKit. Save! Choose a Drag & Drop Template from the Template chooser. Select the Drag & Drop Builder (instructions on how to integrate with the Standard Builder are below). You will need to create a Leadbox that connects with the button on your LeadPage. You can do this within the page builder to connect directly to ConvertKit by clicking on the button. Click the Link icon, and then Create a Leadbox. Click the email input area, and the settings menu will appear on the left hand side. You should see a dropdown menu of your Forms. Choose which Form you'd like to connect. Choose whether you'd like to collect First Name and Email or just Email. Click "Next: Followup" to select your Thank You page. Make sure to do this within LeadPages! Save your changes, otherwise you will need to start all over once you exit. Create a new landing page, and select the 'Standard Builder" option. Click the button on your landing page to open the LeadBox attached to this page. A Form Settings menu should appear on the left hand side. Set 'ConvertKit' from the Integration dropdown menu. Select your Form from the Forms dropdown menu. Save! An Integration Settings menu should appear on the left hand side. NOTE: The Leadbox you create within the Drag & Drop Builder is not the same as a standalone Leadbox. It is specific to that page only, and the integration works differently than with standalone Leadboxes. Do I need to connect with my API key on my account page? The ConvertKit direct integration is now supported on both the Drag & Drop Builder and the Standard Builder! Where should I put my thank-you page? For both Builders, you will add your thank-you page in the Leadpage settings, NOT in ConvertKit. Do I need a Form in ConvertKit if I created a page/box in Leadpages? Yes. You will want to create a new ConvertKit Form for EVERY Leadpage and Leadbox you create. You do not have to do anything to the design of these Forms, but you do have to create a ConvertKit Form that acts as the backend for your Leadpage or LeadBox. It is with this Form that you will edit any ConvertKit Settings, like connecting to a Sequence or an Automation. I connected to the Standard Builder the old way. We would recommend reconnecting via API, using the instructions above.